It’s an ASCE tradition. 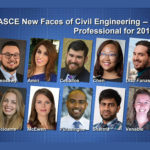 As the calendar turns to the new year, ASCE identifies an exceptional group of rising talents as the New Faces of Civil Engineering, shining spotlights on 10 outstanding young professionals and 10 college students who exemplify the future of the profession. 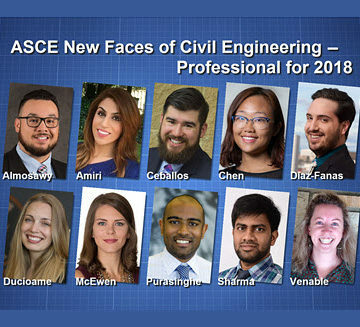 Watch for the announcement of ASCE’s 2018 New Faces of Civil Engineering – College on Jan. 17. You people have got to find a way to recognize a young lady named Caitlin Elizabeth Terry. She founded “How Many Cows”, an organization that brings fresh water and sanitary facilities to impoverished communities all around the Caribbean. She is also associated with “Hydromissions”. Connecting links: https://howmanycows.com/about/ and https://www.hydromissions.org/ . She does so much good for so many people and gets little recognition. I met her at the ASCE Global conference in Panama City and have been following her ever since.